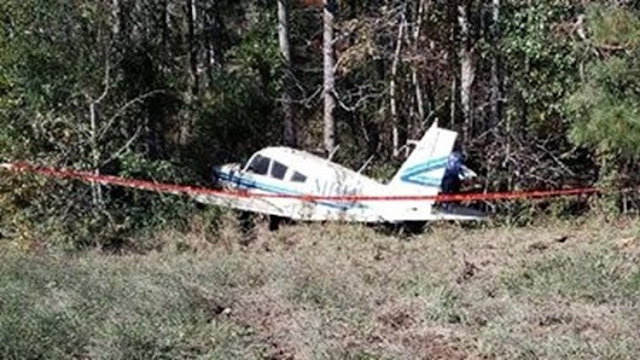 On November 17, 2018, about 1112 eastern standard time, a Piper PA-28-180, N111TA, was substantially damaged after a collision with trees and terrain at Little Tobesofkee Creek Ranch Airport (GA86), Barnesville, Georgia. The flight instructor and student pilot incurred minor injuries, and two passengers were not injured. The airplane was operated by Clear Blue Sky Aviation LLC under the provisions of 14 Code of Federal Regulations Part 91. Visual meteorological conditions prevailed, and no flight plan was filed for the flight to Macon Downtown Airport (MCN), Macon, Georgia. The instructional flight that originating at the time of the accident. The flight instructor reported that runway 35 was selected for the takeoff due to the prevailing wind out of the north at 7 to 8 kts. The student was at the controls for the takeoff. The takeoff was initiated and acceleration seemed normal, considering the runway upslope and 3,000 ft-long turf surface. The airspeed reached 65 kts and was increasing at the predesignated decision point, which was about 60% of the runway length. After takeoff, the airplane banked to the left unexpectedly. The instructor did not recall the stall warning light illuminating. The student called out a lack of responsiveness from the flight controls and the flight instructor simultaneously took the controls. The pilots realized that the airplane would not clear trees at the departure end of the runway, so the flight instructor elected to land the airplane straight ahead and aim it between the trees. The airplane touched down about 200 ft from the trees and continued until it struck several small trees and one large tree. The airplane came to a stop, the engine was secured, and the pilots and passengers egressed the airplane and were met by first responders. An inspector with the Federal Aviation Administration responded to the accident site and examined the wreckage. The airplane crashed in a wooded area to the north of the airport boundary. Structural damage occurred to the wings and fuselage. There was no fire. The wreckage was recovered to a salvage facility where a more detailed examination was performed. The fuselage was generally intact. Both wings were cut off near the wing roots by recovery personnel. The right wing exhibited leading edge crushing signatures from contact with trees. The aileron cables were cut by recovery personnel. The aileron cables were otherwise connected to the ailerons and the ailerons were connected to the attachment points on the wings. Aileron cable continuity was established from the cut ends at the wing roots to the control yokes. Elevator and rudder continuity were confirmed from the control surfaces to the cockpit controls. The vertical stabilizer, rudder, and stabilator were undamaged. The engine remained attached to the firewall. The metal, fixed pitch propeller remained attached to the crankshaft. The engine crankshaft was turned through manually by turning the propeller. Internal engine continuity was confirmed. Compression and suction were observed on all cylinders. Valve action was normal on all cylinders. The engine contained oil. Both spark plugs were removed from each cylinder. They were normal in color and wear when compared to a Champion inspection chart. The carburetor was intact. The venturi and floats were in place and undamaged. The gascolator was drained and it contained about 1 oz of clean, blue-colored fuel. Both magnetos produced a visible spark at all leads when rotated. The stall warning light operated normally when tested. The airplane was not equipped with a stall warning horn. A plane taking off from Redbone Run, a small grass airstrip southeast of Barnesville in Lamar County, crashed Saturday morning. Redbone Run is part of a small flying community off of Community House Road. Authorities responding to the crash found a small plane in the woods, occupied by four people. All four were transported to Macon Medical Center to be checked out for minor injuries. The pilot told authorities that on takeoff, the plane appeared to have a mechanical failure and veered left. The pilot said they were at about tree-level when the failure occurred. The investigation has been turned over to Federal Aviation Administration officials. Mechanical failure, veered left, tree top level? Got me scratching my head. Plane in the pic doesn't look destroyed to me. I've seen crashed planes on here all torn up that are listed as substantial damage. I wonder if he was overweight and the plane wouldn't climb or perhaps stalled and dropped a wingtip. 4 people on a small plane plus full fuel = overloaded.